This is an image of some of the ships company of HMNZS IRIRANGI taken outside the Frigate Block in Waiouru Camp. 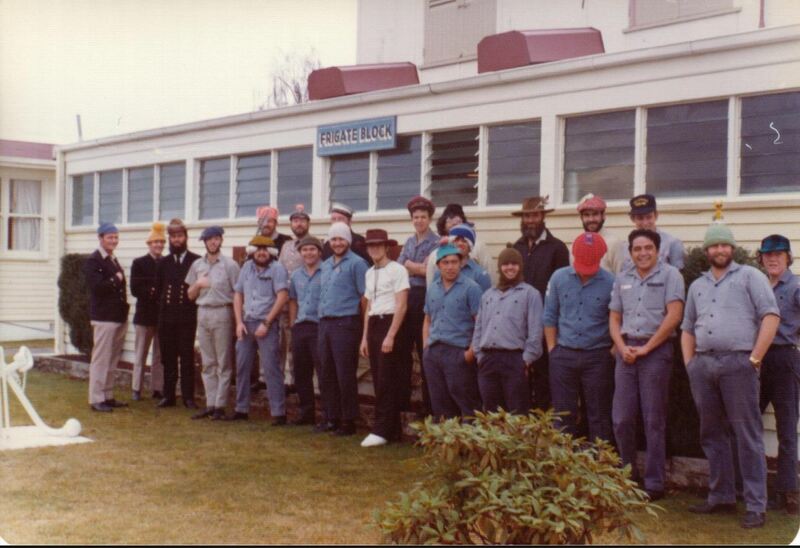 When was it taken – Late 1976/early 1977 What was the occasion – Funny hat competition, and can you name any of these sailors? Stan Stobie far left. David Wiremu Jones in the middle at the back underneath the open louvres and George Randell third from the right. Funny hat competition either late 76 or early 77. I have the winners photo as well, a copy is in the album under Irirangi. Gee, this is getting the grey matter working! In the front row is (I think) Woolif, Lawrence Hunt, Rueben Waaka, Ron Bryant, Dave Patu, Waaka Nathan (behind Dave), Vince Pakinga, Hooky Walker and George Randell. I remember the last guy’s face but can’t put a name to it….